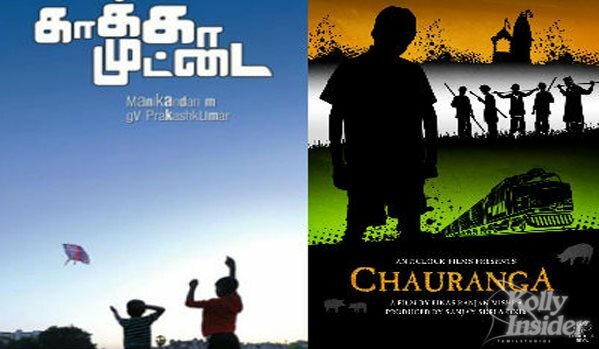 M Manikandan's "Kaaka Muttai" won the Best Feature award (Audience Choice) at the Indian Film Festival of Los Angeles (IFFLA) while Filmmaker Bikas Ranjan Mishra's "Chauranga" won the Best Feature (Grand Jury) award. Dhanush produced Tamil feature film "Kaaka Muttai" has been awarded the Best Feature Film at IFFLA under peoples choice along with the jury award for National Award winners child actors Ramesh and Vignesh. Happy film maker Dhanush took the reports to his Twitter page and shared: "Kaakkaa Muttai has won the best feature film, audience choice and best actors, grand jury award, for Ramesh and vignesh @iffla .. Proud "
Kaaka Sattai had its first world premiere at Toronto International Film Festival and now at Indian Film Festival in Los Angeles. Directed by M Manikandan, Kaaka Muttai is about two brothers living in a slum. Co-produced by Vetrimaaran, Kaaka Muttai also features Ramesh Thilaganathan and Aishwarya Rajesh in key roles. It was also announced at the awards ceremony, held at West Sunset Boulevard here on Sunday, that Indian actresses Kalki Koechlin and Shweta Tripathi were in a tie as winners of the Best Actress award for "Margarita with a Straw" and "Haraamkhor" respectively. "Chauranga", co-produced by Sanjay Suri and Onir, stars Sanjay and Tannishtha Chatterjee and is a fictional account of six days in a dark corner of India, telling a story of violence of class oppression that still exists in rural India. Onir tweeted: "Super Proud That our film #CHAURANGA won the BEST FEATURE - GRAND JURY prize at #IFFLA :). (sic)"
"Thrilled ! #CHAURANGA wins Best Feature (GRAND JURY) prize at #IFFLA2015 @bikas @IamOnir @TannishthaC @ArpitaCP," Sanjay tweeted. The Best Short Film (Audience Choice) award was given to "Safar" by Pratyusha Gupta, while the Grand Jury prize in the same segment went to "Dandekar Makes A Sandwich" by Leena Pendharkar.